The whole world knows that Clint Eastwood made a rather unconventional presentation at the Republican convention last week, and they've heard from everybody and their brother what they thought about it. But nobody has heard from Eastwood since Thursday night ... until now. He gave us his first interview after his momentous appearance and explained how it happened, what he intended to do, what he thinks about the aftermath and why he thinks Barack Obama is a failed president ... more preview. 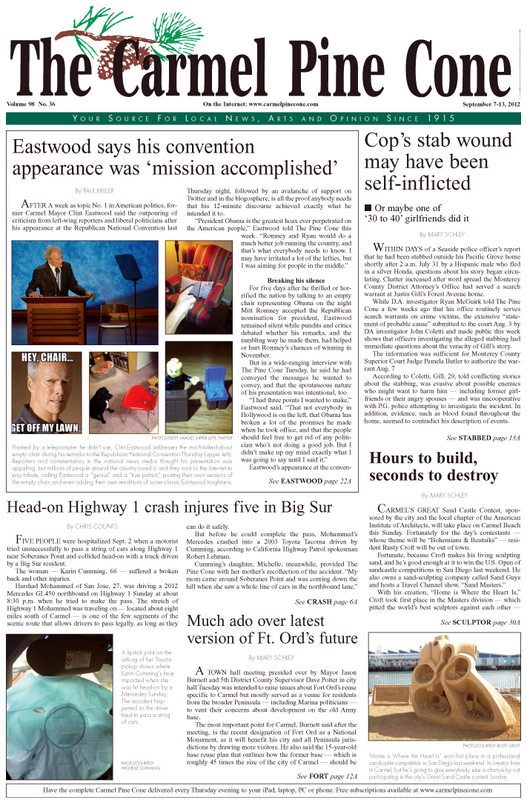 To download the September 7, 2012, front page, please click here (1 mb). To download the September 7, 2012, Main News section, please click here (11 mb). To download the September 7, 2012, Real Estate section, please click here (12 mb).